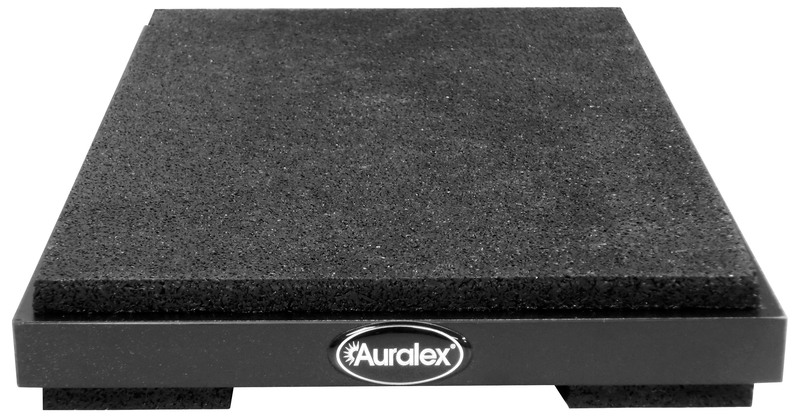 INDIANAPOLIS, IN, August 1, 2012 – Auralex® Acoustics, Inc., the world’s leading brand of acoustical treatments and soon to celebrate its 35th anniversary, is now shipping its new ProPAD™ Monitor Isolation Pad, the latest product in its ISO (Instant Sound Optimizer) line. The ProPAD is a premium-performance variant on Auralex’s popular MoPAD™. Compared to the MoPAD, ProPAD has increased durability and structural integrity, and provides superior isolation from the vibrations and resonant energy created by studio monitors. The ProPAD prevents this energy from being transmitted into the supporting furniture, which would greatly color the monitors’ sound and degrade their imaging. The ProPAD is sold in stereo pairs and is designed to work with nearfield monitors employing up to 8" woofers. ProPAD’s updated design features a 0.75" layer of laminated black MDF covered with a thick layer of Auralex’s proprietary IsoPuck™ isolation material, which is made of recycled rubber. Six stick-on feet, also made from IsoPuck material, are supplied for flat or angled applications. The ProPAD is the perfect solution for decoupling monitors and reducing structural vibration in all manner of sound-critical spaces, including recording studios, post-production/edit suites, mobile recording facilities, hi-fi listening rooms, home theaters or anywhere a monitor/speaker isolation platform is needed to improve sonic purity.